Skin irritation is the number one reason that dogs get taken to the vets. You can care for your dog by feeding him high-quality nutrients that are specially calibrated to care for and soothe sensitive skin. Skin sensitivities often lead to excessive scratching, which can further damage your dog’s skin and even potentially cause infection. 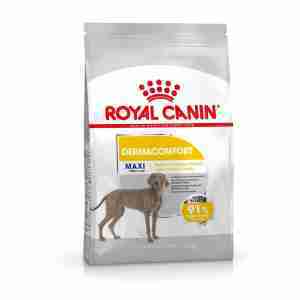 Royal Canin Dermacomfort Maxi is tailored with active nutrients that help to support your dog’s skin health. Enriched with Omega 3 and 6 fatty acids, this food helps to soothe the skin, making it less sensitive to irritants that may be present in your dog’s environment. This specific nutrients contribute to a healthy and shiny coat. Suitable for dogs that weigh between 26kg and 44kg, Royal Canin Dermacomfort Medium contains kibble that’s carefully designed to perfectly fit between your dog’s teeth, also contributing to teeth cleaning and removal of plaque. Royal Canin only use the highest quality proteins, these perfect for sensitive tummies and too assist in help a smoother digestion. 91% of owners were satisfied with this product after just 2 months of continued use. This means that Royal Canin’s Dermacomfort Maxi’s results are a proven success. Ingredients: rice, wheat gluten, wheat, animal fats, maize, maize gluten, huskedoats, hydrolysed poultry liver, minerals, soya oil, beet pulp, fish oil (sourceof EPA and DHA), flax seeds (source of omega 3), fructo-oligosaccharides,borage oil (source of gamma-linolenic acid), marigold extract (source oflutein). ADDITIVES (per kg): Nutritional additives: Vitamin A: 30000 IU,Vitamin D3: 800 IU, E1 (Iron): 56 mg, E2 (Iodine): 5.6 mg, E4 (Copper): 11 mg,E5 (Manganese): 73 mg, E6 (Zinc): 219 mg, E8 (Selenium): 0.13 mg -Preservatives- Antioxidants. ANALYTICAL CONSTITUENTS: Protein: 25% -Fat content: 17% - Crudeash: 6% - Crude fibres: 1.5% - Per kg: Omega 6 fatty acids: 36.2 g includinggamma-linolenic acid: 0.5 g - Omega 3 fatty acids: 10.5 g including EPA andDHA: 4.1g.